FEE, fi, fo fum, I smell the launch of The Kings’ pantomime! The Southsea theatre brought out the stars as it kicked off its big show for this year’s festive season – Jack and The Beanstalk. ‘Allo, ‘Allo! star Vicki Michelle plays the Fairy Godmother, and she is joined by Anne Hegerty, of ITV’s hit game show The Chase, as the villain of the piece, Blackweed. They are joined by a brace of X Factor veterans, 2013 finalist Sam Callahan and Jade Ellis – who is back at The Kings after starring in 2014’s production of Aladdin. 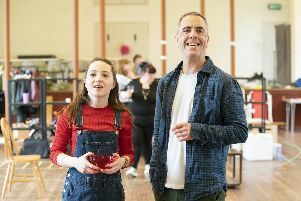 Phil Randall makes it three in a row as the show’s dame, and Matt Dallen is also back, as Simple Simon, after appearing in last year’s Cinderella. And Gosport-born Hollyoaks star Marcus Patrick rounds out the major players as The King. Vicki was at the Kings only earlier this year, in the play The Naked Truth – directed by Kings’ patron Lisa Riley. Vicki said: ‘When we did The Naked Truth here it was fantastic – it was a fantastic audience. And there’s nothing better than appearing in a theatre like this, it’s stunning. ‘Sadly there aren’t many like it left. The acoustics here are amazing, and in theatres like this the audience feel like they’re part of the show. Anne, who is known as The Governess on The Chase, is playing the bad guy for her fourth panto in a row. ‘I was a baddie in all of them, I’m never allowed to be the fairy. I can’t imagine why,’ Anne laughed. Phil added: ‘I love everything about panto – the fun you have and the people you meet, it’s great fun. And the kids love it. ‘The dame is a great comedy role, and she’s loved by everyone from two to 92. Jack and The Beanstalk is at The Kings from December 6 to January 1. Tickets cost from £10.50 to £28 depending on time, date, location and age. Go to kingsportsmouth.co.uk, call the box office on (023) 9282 8282 or in person from 10am to 6pm Monday to Saturday.